THEY SAY THERE ARE NOW MORE PEOPLE working on technology every single day than there have been in the whole of human history put together, and when I compare today’s torches against some of the lamps I’ve owned in the past, I’m tempted to believe that most of those people are working to improve diving lights. To turn on one lamp I had to flick the switch, then bang the thing against my leg until the bulb glowed into life. Another would start to flood every time I strode into the water, and so predictably that I could use it to set my dive-time. The D570 fits the hand well and would be travel-friendly. And then there was the actual light output achieved in the pre-LED era. Quite honestly, a candle in a jam-jar would have been a better option. It certainly would on the dive on which my main and back-up both failed, as did those of my buddy. It’s no wonder that I have a reputation for using the Force to navigate. And don’t get me started on the size and weight of the lamps we had to carry, mostly because they used such mahoosive batteries. 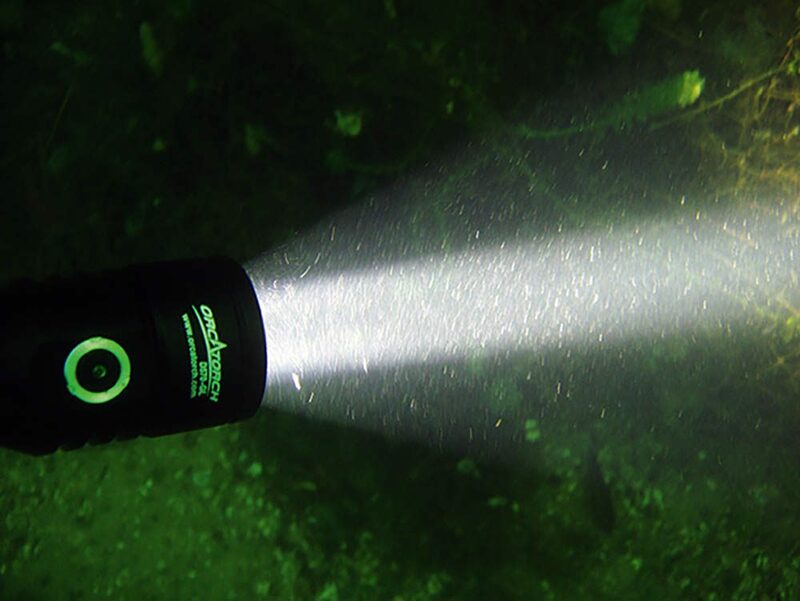 By comparison, today’s dive-torches are small, lightweight, reliable and ridiculously bright, and that brings me directly to the Sea&Sea Orca range, from which I was sent the Orca D570 for test. The Orca comes in an orange box that boldly claims that the lamp puts out 1000 lumens, has a maximum burntime of one hour and 51 minutes and comes with a built-in green (or red, your choice) laser with a range of 1 kilometre. A built-in laser, wow, talk about shelf-appeal! Inside the box you get the torch, a 18650 battery and charger unit, a wrist-lanyard, and a spare set of O-rings. First job was to fully charge the battery, which is supplied part-charged, and I found that the charger unit comes with a cable to connect to a mobile-phone charger plug, which is not supplied. But hey, no big deal, you and I both have about a dozen old mobile plugs lurking in drawers all around the house, so not being given another one doesn’t much matter. The unit is small, so it’s lightweight but very solid. 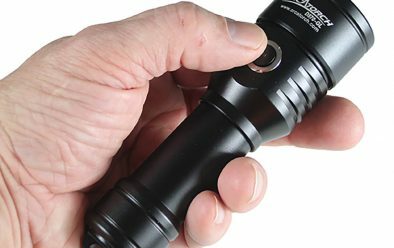 The metal body is about the thickness of your thumb, with one end broadening substantially to hold the bulb unit and the other end with a hefty lug to take the lanyard. 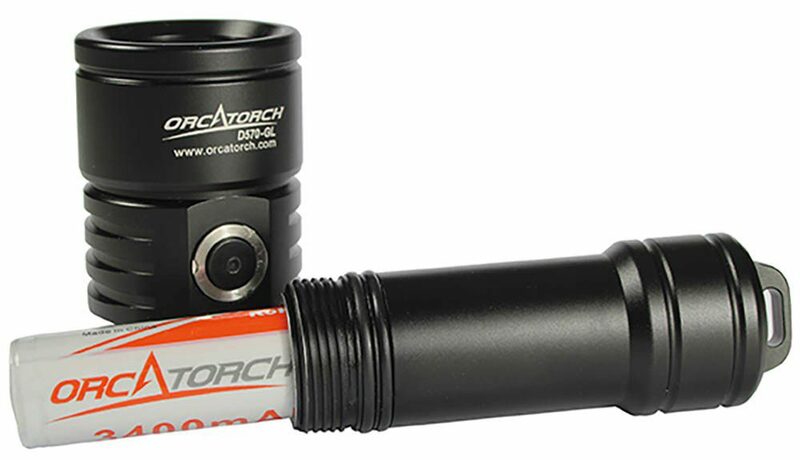 The torch barrel seals with two O-rings and uses an 18650 rechargeable battery. 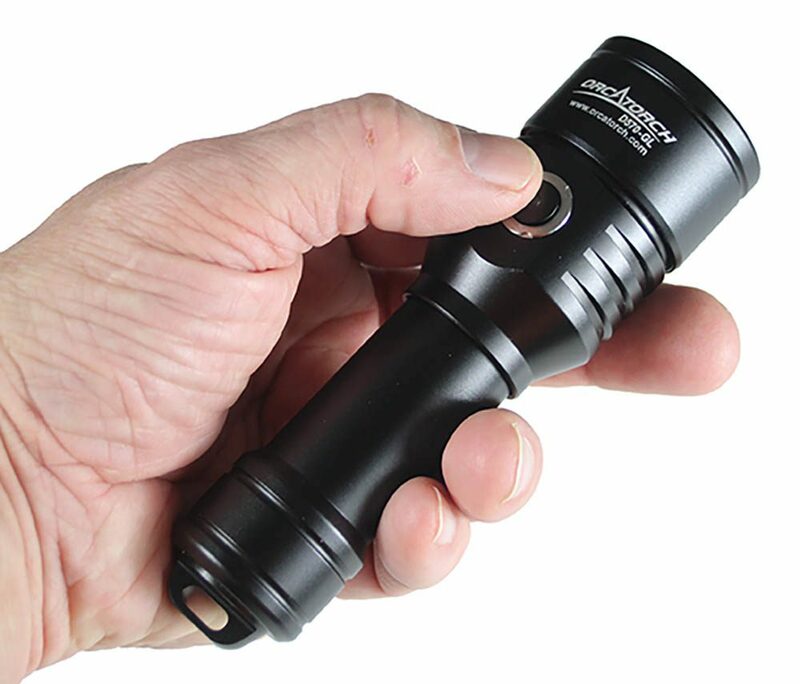 Hold the torch in two hands to unscrew the body from the lamp-head, exposing the two sealing O-rings, and the battery slides easily into place with no rattles. A small titanium-alloy button on top of the unit gets things going. You press and hold to get the laser beam or press twice for the torch beam proper – think double-clicking a mouse button. Relax the pressure on the switch to turn off the laser, or double-click to turn the torch off. 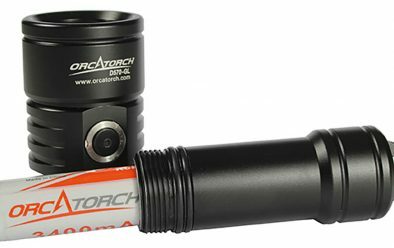 You can have the laser on at the same time as the torch. The switch is a sealed unit, so it shouldn’t leak. It’s easy to feel and find with bare hands, but the button is only just proud of the lamp-head, so with gloves I needed to look to see where it was, though pushing and double-clicking was still easy. The intense 8° central beam is surrounded by a less-bright halo. At this point I’ll ’fess up and say that I thought everything about the D570 screamed back-up lamp, right up until I actually turned the torch on and saw how much light it pumps out. It’s eye-opening how bright modern lamps really are. The beam has an 8° central cone surrounded by a much fainter halo. Under water, the central beam punches through the murk while the halo provides enough peripheral illumination to avoid bits of wreck without being so bright that it lights up all the detritus in the water. Sure, there have been dives when I would have liked something more than the D570 can deliver, but in all honesty, for 99.9% of my dives it would have been perfectly fine as my primary light. And you remember that laser? Gimmick, right? 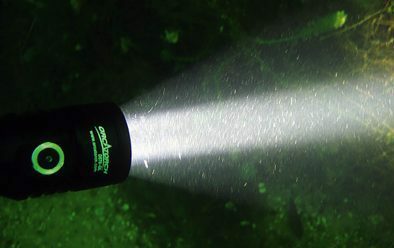 Well, you can point out tiny stuff under water very easily with it at any time, and on night-dives it was sufficiently different from other lamps to attract attention. It might also be useful as a safety device topside, so I can see a place for it, but for me it wouldn’t be a deal-maker or breaker. Back to the 1hr 51min and 1000m claims, and the D570 did indeed illuminate the interior of my test bucket for that time, after which the battery took around 3.5 hours to fully recharge, and I could take it upstairs to hang out of the window and throw a green spot onto the tower of the local church, which is just over half a mile away. That’s near enough to the claimed 1000m for me. Oh, and Sea & Sea claims a 150m depth rating, but I’ll confess to not having checked that out properly, what with it being mid-winter. All in all, it’s a cracking unit, and I’m only holding back a single star because it costs £150, which is a not-insubstantial amount of money. I’m sure that if you’re less fiscally motivated than me you won’t be disappointed, however.